First I’m going to have a debrief. I’ll be the first to say I don’t take criticism in life very well and have never had to with my card making. I had, what I would consider, a negative comment left for me on Sunday and I actually felt a bit put out about it all day. The comment was about how all of my cards look the same and how I repeat the worn and torn edges in all of my cards. Worn and torn edges are repeated by a lot of card makers who create in the same style as myself. I’m not an expert on styles but I consider this to be along the lines of shabby chic/vintage. I also think I try and add different details to each card so they don’t look the same. One of the designs teams I’m on requires a clean card and I think I achieve this style too (the DT must think so as I’m still on their DT after 14 months!). I think I can be versatile when required and if you take a look back at my blog you will see I try to mix it up between styles. Anyway, do I not have the right to make MY cards how I want? I’ve been struggling to create probably from last year when I fractured my elbow. This changed about a week ago and I was actually wanting to go out to my craft room again. Then I got this anonymous comment. >:-( If you don’t like my cards, and feel I repeat the worn and torn look, then don’t follow my blog. Simple. Sorry for the long whinge, but it was better than my first reply that consisted of 2 words – it started with an F and ended with a U! I really do appreciate and love all the positive comments I get – so I guess this one just threw me. Now on to my card, which you will see, is a clean card with no “worn and torn edges”. Beautiful card love the colours especially. Don’t listen to the negatives believe in yourself. HI Narelle, what a lovely card. I just read your comments and felt i had to let you know that your work is always beautiful and there are lots of people who draw inspiration from your samples. I have been admiring your work for a long time now. It is off-putting when those negative comments arise but don’t be disheartened. You are very talented. Keep at it. Im so glad your elbow is better now – it can feel like you’ve lost an arm when you can’t be creative! It’s funny how a negative comment can eat at you. 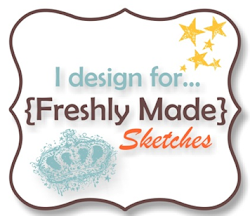 I will tell you that yours was the first blog I ever followed after seeing your work on a challenge site and falling in love with your style and I love to see what you create and wish that I could craft like you! It was actually an injury that got me really into card making when a leg injury last year kept me off my feet for six weeks, so at least I could craft, but I do understand that moment when suddenly you realise that you have your life back again. As always, this card is harmoniously composed, the colours composition is wonderful and the execution perfect. A very stylish and elegant card. Been following your blog for ages, love your work. Your style is unique and enviable. Keep doing whatever you are doing because it works. I first want to say that I am sorry your work was “attacked” and you had a bad day because of it. I only recently found your work, probably on one of the challenges. I can say I an not a big fan if the shabby chic look but you have every right to produce what you want as an artist. And in that regard you have my support. Do what’s in your heart to do. And I love what you produced on this challenge! Your work is BEAUTIFUL! I would never have known that you’ve been struggling to create-hope that elbow continues to get better! I absolutely love your shabby/vintage style. You and Julie G are the BEST! I have a pinterest board with cards from only the two of you-my favorites! I get email updates for your blog and I’m always excited when I get up in the morning and check my mail and see there is a post from you. See? You make my day! Haters gonna hate-don’t let them bring you down to their level. Just keep putting out those beautiful cards! Don’t worry too much about odd comments. I think you do a great job on all your cards! You gave the right response – if people don’t like it, don’t read! I have been following you for quite awhile and will continue to do so! Hope your arm gets better quick! I love your cards, they are so beautiful and personally, I love your torn and distressed look. If that is your style, who cares what anyone else thinks? Keep up the gorgeous work! They leave negative comments because they have NOTHING else in their lives. So sad when they leave comments on blogs just because of their negativity. Your cards are beautiful and you inspire me every single time I see one of them. Please ignore this person…obviously there will be those in this world but they can only defeat you if YOU let them. Keep inspiring us! I tend to make CAS cards, but that is my style, reading blogs helps me to step out and try other types of stamping. Your style is who you are, celebrate you. Not sure why some people always put down others especially on the internet, and then to not even sign their name. Your cards are beautiful, they make you who you are. If we all used the same card making style what would be the point. Your card this morning is awesome as always. Well, personally I love your shabby chic style!! I think you are an amazing card designer and I am often in awe of your work. Don’t let a “negative Nelly” get you down. Smile!! You have a great following on you blog. Thanks for sharing all your work. I visit you blog everyday, and there are times when I am unable to leave a sweet comment because I am at work, but know that I admire all of your styles, and you an incredible card-maker! So sorry that a negative came to you. I have to presume the Nellie Negative can do better? Is she on a design Team? Has she a person like me who has created a folder just for Narelle’s Works? I think not! Do NOT let ONE person bring you down. You work is fabulous! Keep them coming! I agree, if they do not like your cards…unsubscribe or in a challenge, scroll past. I do that to others that are not my taste. I would never be so snarky to leave a negative comment. I guess some people need to do that to feel superior. So sad. Well, keep up the great work and I do look forward to your cards! Beautiful card Narelle,don’t let one negative person put you of,love ,love,love your style ! I think she doesn’t look at your blog often enough to see the wide variety of gorgeous cards you create. I love your cards and I aspire to make cards like yours. I love all your cards! Don’t take any notice of negative comments especially if they’re hiding behind anonymity! This is just beautiful! Love the purple. Thanks for playing along with Mojo Monday! OMG, Narelle! I can’t believe that anyone HAS a bad thought about your work, much less the nerve to post it! I all but swoon over practically everything you make and Pin the vast majority of it. I’m like the other commenter here–I could have a Pin board of JUST your cards and it would be loaded up! Your style is mostly shabby chic for sure, of course, but I’ve definitely seen really “clean” creations from you, too. And YOUR STYLE-chic or clean-is wonderful and YOU. Don’t change that at all! (And THIS card is gorgeous, too! What?!? I never cease to be astonished by how some people feel the need to share their unsolicited, hurtful opinions. Obviously, the problem is with her because there are way too many of us who love your work! I think my style is very different from yours, but that doesn’t stop me from loving your blog and work. In fact, it’s probably the opposite — it’s so hard for me to make anything with your style, that I admire and love your work even more. Put that comment in spam and keep on doing what you do! Hugs! Narelle, as a fellow blogger, I do appreciate suggestions if I ‘state’ I am struggling with a layout/color combo, etc. I appreciate compliments, encouragement, and plain sweet comments. I believe that these validate what I am doing. Directly and indirectly. Comments help motivate, and assure that what we create IS beautiful and inspiring to others! I also understand, and support your debriefing. I understand your hurt feelings, and your second guess to craft. Words can hurt, and I agree, ‘if you don’t like my creations, move to the next blog!’ (and any other version of that) I do accept constructive criticism and NOT ugliness. I looked through your blog, and honestly, all I found was some very pretty, creatively executed crafting, incredible inspiration, and clever coordinating papers, embellishments, and layouts. I am happy you have continued to craft! Because YOU DO CREATE BEAUTIFUL, AND INSPIRING CARDS!!! and I am becoming a new follower. I hope you continue to find your way into your craft room, and find inspiration to keep creating! and I hope your elbow is heeling more and more everyday. Best wishes to you, and happy crafting! I would actually love to get some constructive criticism so I could improve & understand what keeps a card from being chosen a winner, but to leave a negative comment anonymously is just plain mean & cowardly! You’re so right–if you don’t like someone’s work don’t follow them! This card is absolutely beautiful–love every element! When I think about some of the really great card makers: Michelle Zindorf, Julee Tillman, Kath Stewart, Becca Feeken, Teneale Williams, and so many more, all have an identifiable style. I know exactly who they are even when their names aren’t readily apparent. Your cards are lovely. I sort of stalk your blog because your cards are so good. And you’re right! Just F…orget ’em if they are so mean spirited. I have always been inspired by your cards. Even though shabby chic is not my style, I look at other elements of the card for inspiration. It’s because of your cards that I have chosen to buy more floral type stamps and experiment with them a little more. Every day I look forward to seeing your card, like peeking out the window to a garden to see what has bloomed today. Sometimes just to enjoy the view. I follow many blogs that inspire me to create something new, sometimes I look at post after post and just feel “Nyeh!”, but I would never say I don’t like it in the comment box. I just delete it! I too have had health issues over the past year, and am happy to say I am feeling better in the last month or so than I have in about 14 months. I am finally in the craft room spending lots of time creating. I have to admit that I am doing a lot of CASEing, because the creativity vibe is still a little buried, but it’s coming back around. We all have our good days, and bad, but we will just have to stuff that negativity down, and get back to what we enjoy the most. Keep up the great work, and don’t try to change too much. Narelle, all the cards I have ever seen of yours are outstanding. Even my sister, who makes the best cards around, thinks you are SO wonderful! I bet that the cards of the negative commentor totally BLOW, and she is just jealous of you. I love the shabby, tattered vintage look: keep up the unique work! You need to ignore that negativity! Some people just aren’t nice and can’t say anything nice. Usually that negativity stems from jealously – I know I’m totally jealous of your cards and skills but I love seeing your cards and love being able to tell you that through comments! This card is just beautiful! I love it! What a fabulous design! Your cards always make me so happy! Apparently someone forgot the old adage “If you can’t say something nice, say nothing”. Please don’t waste another second on someone who clearly feels the need to tear someone down in order to make themselves feel more important. Your style is recognizable because of your meticulous details and gorgeous elements. Many of us wish to channel a little Narelle on our cards!! Ok….I know I do! Hugs, my friend! Narelle – pretty card. VERY pretty. And I’m gonna guess that those happy thoughts are not directed to the mean girl. 😉 Shake it off. This craft about happiness and fun.